I have decided to go Sydney - Alice Springs - Perth and leave the Darwin leg. In pricing Manchester - Sydney - Perth - Manchester, I found it to be cheaper anyway and Sydney looks fantastic. Also, between Sydney and Alice Springs lie Canberra, Woomera and Coober Pedy which are superb targets to aim for. So after your response I researched further and changed my itinerary. We (my wife and I) arrive in Sydney at around 08.00. Even allowing for delayed baggage reclaim, this is very early to check into a hotel. Do hoteliers in Australia appreciate this situation as a rule and allow you to check in and get some sleep after such a long journey? Is a visa required for Australia? Some say $20, some say it's free but you pay to leave? How many areas of Aboriginal permission would I need for Sydney - Alice Springs - Uluru - Perth? Do you have Sat Nav to hire like Garmin or Tom Tom in Australia? Although the roads in The Outback are few, Sat nav is a good way of counting down the miles as you drive and establish targets. You really have whet my appetite in talking about campers. My wife and I adore a car and a motel in the U.S.A. Is the road between Sydney and Alice Springs very much like a typical American drive i.e. settlements/towns with McDonald's, Denny's, Comfort Inn, Fuel etc... spaced periodically on the Highway? In selecting a camper (which we would love to have a bash at) we have a quandary in, if you choose a Motorhome for comfort (TV, Air Con etc.....) you lose any off road capability (less than a regular car I would think). If you choose a 4WD camper, you lose the space a motorhome provides. Do you feel it is a good idea to go from Sydney to Alice Springs by car and then rent a Camper to Perth? I think that is it for the moment. Many thanks again for your top service. All I can suggest here is that you choose your accommodation in Sydney before you get there, and ring or email them to let them know your arrival time. Planes from overseas arrive in Sydney around the clock so I am sure the hotels get that request regularly. Is a visa required for Australia? Australia travel visa information is here. The one you want is the ETA (electronic travel authority). Just follow the link to where you can apply online. It takes you to the government website. Everything you need is there. The service charge is $20. You don't say which route you plan to take from Sydney to Alice Springs, but if you stick to the normal routes (no detours via adventurous desert crossings) you won't cross any Aboriginal country. You will never leave the bitumen and you certainly need no additional permits. I had to look into this first (I never pay attention to brand names) but from what I've seen you should be able to find both normal cars and also campervans already equipped with GPS satellite navigation. Contacting the hire car companies directly is your best bet here. What is the road between Sydney and Alice Springs like? Again, to some extent it depends which route you take. But in general the south east corner of Australia is very crowded (by my standards), much like what you describe for the US. Coober Pedy is the only town after Port Augusta, and it's about half way between Adelaide and Alice Springs. Do you feel it is a good idea to go from Sydney to Alice Springs by car and then rent a camper to Perth? Actually, yes. That does sound like a very good idea in your case. This one I can't answer. To start with I really don't know the populated south east corner of Australia that well. There is a lot to see! Your schedule sounds very tight to me. It's doable, but you will have to bypass many nice places for lack of time. Where to stop and what to skip is too much of an individual decision to give advice here. But those decisions will determine when you will arrive in Alice Springs. You still have a lot of time to research. The permits you are concerned about are just a formality. You can sort them out when you get here, a few days before you need them. The only advice I can give you right now is to keep reading and researching. You are crossing a whole continent. The amount of beautiful places to see in Australia is overwhelming, and people have different preferences. So before you can determine a target date to be in Alice Springs you need to decide which attractions are the most important to you. You have to pick the main things you want to see, decide how much time you want to have available there, and then organise the driving around that. You can cover a lot of distance if you just drive, so it really depends on the stops. And those decisions I can't help you with. On top of that I can't emphasize enough just how little time you have available. Have a good look at the distances involved. You will not have all that much time to stop on the way! An extremely comprehensive and thorough response. Many thanks. Sorry to keep asking questions which are pretty well covered in your site. I think it's nerves. My research has progressed (through forums and books) and I have now graduated to a campervan. I have gone as far as to book the flight so I WILL be coming. 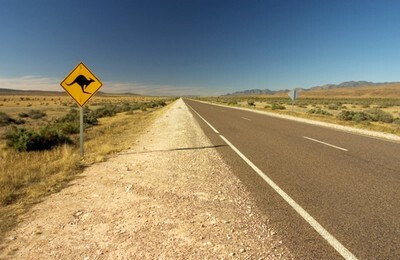 Sydney to Perth via Alice Springs is the aim, March 13th to April 5th. Arrive in Sydney 15th March at 08.00. Couple of days to acclimatize, set out on 17th March for Alice Springs. Have a target of April 3rd to arrive in Perth so this gives me 17 days which I think should be sufficient (I hope). but have just found out that you are not allowed to carry extra fuel. I am also concerned that I will need a 4WD camper. I don't intend to go off road to any great extent (don't want to get lost and as you observe, tied for time). However, can't help but feel that there might be occasion when the big wheels would be handy. The 4WD campers seem (by definition) much more rough and ready than the comfy, somewhat delicate looking KEA. I am struggling with this one. What are your views? Don't worry about asking questions that are covered on the site. To find everything that's relevant for any individual trip takes time. Through your questions I am able to point people directly at the pages/sections that are interesting for this specific trip. Other readers will benefit from your questions as well. So don't worry about asking! Your campervan: check with KEA. I doubt they allow you to take a 2WD vehicle off road. Most hire companies don't. You will have a hard time finding a hire company that lets you take a normal camper off road. Also, as I pointed out in the response to your first question (Perth to Darwin), especially when also considering the time of the year, a 4WD is the better choice anyway! Hi. I live in Melbourne. I have done most of what you are planning. (Except Manchester!) In a conventional drive station wagon. Just doing the 'west coast, Darwin and down the middle half' took 12 weeks!! Melbourne to Melbourne. The east coast similarly, but about ten weeks if you go to the end of the bitumen at Cape Tribulation in Tropical North Queensland. A lovely spot. I use cabins in 'Tourist Parks' or budget priced motels. I am not good at camping ! Australia is awkward to tour properly as it is sort of divided into two halves. It needs a 'circuit' trip otherwise back-tracking. For example, your plan of the section from Alice Springs to Perth is a typical dilemma. The most comfortable and safest way - fully surfaced all the way - means that, from there, you have to go back down to Port Augusta, (you would have come 'up' from there on your journey from Sydney, via Broken Hill I presume) then head west for Ceduna and 'step off' across the Nullabor Plain. To me it is a fascinating journey. Others could find it tedious. The best part of three days for that alone by the time you reach, say, Kalgoorlie !! I have travelled the 'Great Central Road' which is the alternative from Uluru into Kalgoorlie. (I travelled in the reverse direction). That is unsealed for approximately 1200 kms. It is sealed westward to Perth from the fascinating mining town of Laverton. Although fairly well maintained all that goes with travelling unsealed 'roads' has to be coped with. I would be happy to help with more info if required. Also pages on other web-sites. I think that previous respondents have failed to point out that much of the trip from Alice Springs to Perth is unsealed. It's sealed from about Laverton through to Perth, but unsealed from Alice Springs to Laverton. No date on the web page so no idea when your questions were posted. Put simply you can't drive Sydney to Alice! Not unless you have a very well equipped 4wd and extensive experience in remote area travel. There are no roads that are direct, only sand tracks. There is one road to (through) Alice suitable for cars or campers, and it runs north south, Darwin to Alice to Port Augusta (near Adelaide). If you want to go Sydney to Alice to Perth, you will be best going north out of Sydney and looping up through Queensland to the NT. You don't go all the way to Darwin, but so close you might as well. After Alice south again with a detour out to Uluru. You can do the loop as in the previous post, but not in a rented camper: hundreds of km of corrugated gravel outback roads. Many rental places don't allow gravel roads. Keep driving south forever and the turn right at Port Augusta. Drive for another five years and you'll arrive in Perth. I've worked and thus driven throughout Australia. My current vehicle for outback travel has 180 liters fuel cap, 100 liters water cap, two spare wheels and enough recovery gear to make McGyver cry. This is what you need if you want to go direct Sydney to Alice, and then Alice to Perth. The sealed roads are long, but great and a well worn path for overseas travelers. Make the most and take in Queensland, Darwin, Esperance etc. I've only given one option, and you could drive from PA north to Alice, then to Darwin, then west to Perth. Bloody long way but excellent country. Lot of gravel. I have read all your comments. I want some advice from you. I want to go 4x4 with a camper from Alice Springs to Perth in 7 days. Is it very hot in that month? Help me please (sorry for my bad English). 4WD with air conditioning and good supplies. Maybe a satellite phone or EPIRB. Very, very hot but well worth the experience. If I may take the liberty: This may be helpful. I'm slowly uploading video clips of my driving experiences around our Aussie, mostly outback. They are of varying quality and each generally less than eight or so minutes duration. One of more than usual interest is my trip across the 'Great Central Road' - from (Kalgoorlie) Laverton into the west side of Kata Tjuta (The Olgas). Sunset on The Olgas, from behind, is a rare treat for sure. Twelve hundred kms unsealed in a 'vintage' Sigma standard station wagon was an adventure. Happy viewing and safe traveling. A small 'road surface' clarification. Then 1200 kms unsealed to Laverton, but done OK in my two wheel drive. Certainly fairly bumpy at times, but safe. A vehicle coming the other way about every half hour or so. May I invite you to my relevant video clips, as above. To me, quite do-able! Just a warning regarding the Great Central Road. Of course, as with all unsealed roads, it can be affected, at times seriously, by rain. One needs to check with an authority before beginning. I was lucky. Those in the know would be aware that access to parts of the famous Gunbarrell Highway occur along the way. A legacy of the great Len Biddell. After going through all the comments above, it seems to me that driving from Sydney to Alice Springs is not that easy as I was thinking. I am planning for a trip in mid-December in 2WD from Sydney to Alice Springs and back to Sydney. Please advise whether there are unsealed roads in the journey between the two destinations. Also, I would like to know about the accommodation. I am planning to camp each night after driving for 8 hours in a day. All the roads for this journey are sealed and really good quality. No worries whatsoever. Just a little unsure thank you.